Nearly all picture frames get nicked and scratched from time to time, and a little touch-up is usually all they need. These permanent markers in wood stain colors will do the trick. 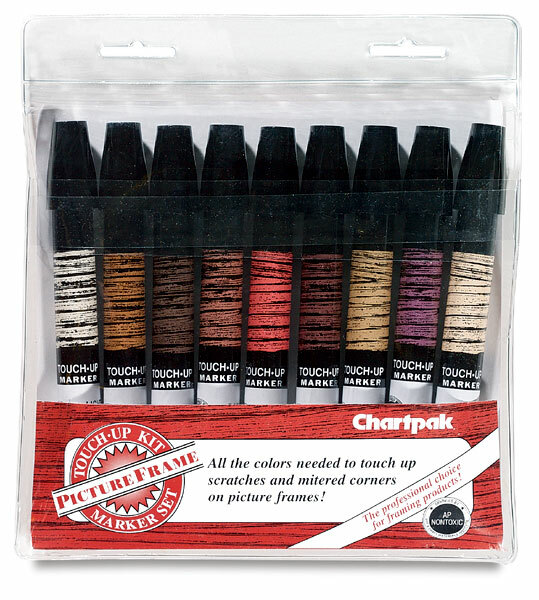 The set contains nine markers, representing a range of popular framing wood tones. Any artist who sells framed works of art will want to own a set for making those occasional touch-ups and repairs. 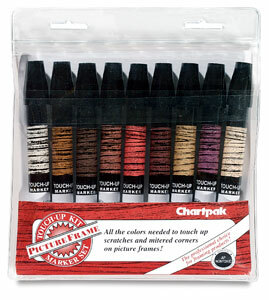 Chartpak's Touch-Up Markers are blender markers that allow you to achieve almost any stain color. Cover up join lines on new frames and scratches on old frames instantly. Each marker has a long-lasting ink supply and a large, firm chisel tip. Markers come in a clear vinyl pouch that makes it easy to see all nine markers.